The past two weeks have been absolutely stunning. Howard’s latest post on his “Mangled Magnetosphere” thread was very good; frightening, in fact. What he didn’t say was that space is quiet, except for one M-Class flare, which has not hit earth yet. This is all Planet X! There is NO solar wind, as evidenced by the model below.http://www.swpc.noaa.gov/products/wsa-enlil-solar-wind-prediction [and from another] http://poleshift.ning.com/profiles/blog/show?id=3863141%3ABlogPost%... Multiple eddy flows of magnetons behind the Earth over the past 24 hours. A second day with multiple eddy flows forming inside Earth's magnetosphere. Since a magnetic eddy flow appeared behind the Earth in 2010, matters have gotten worse for planet Earth. The magnetic N Pole of Planet X, aka Nibiru, has increasingly turned to point directly at the Earth. This is due to Planet X coming closer to the Earth, on its outbound path, and thus tightening the crab-like pincer squeeze it has upon the Earth. It is also positioned more directly in front of the Earth, rather than to the side coming at the Earth in its retrograde orbit. Both these trends will continue unabated until the Last Weeks commence. The Earth’s magnetic field normally unfolds around it, uninhibited by all but solar emissions which tend to blow the magnetic field back, away from the Sun. Now it is being distorted on all sides, pressed back tightly around the Earth so there is no room for magnetons to maneuver. This is, as has been noted, not due to the Sun, although NASA et al will try to claim that in some manner. We have from the start of the ZetaTalk saga predicted that blaming the Sun would be a prime cover for the approach of Nibiru. It is the solar minimum, and the Sun is presently asleep. What does this eddy flow of magnetons showing up in the Earth’s magnetic models mean for the near future of planet Earth? 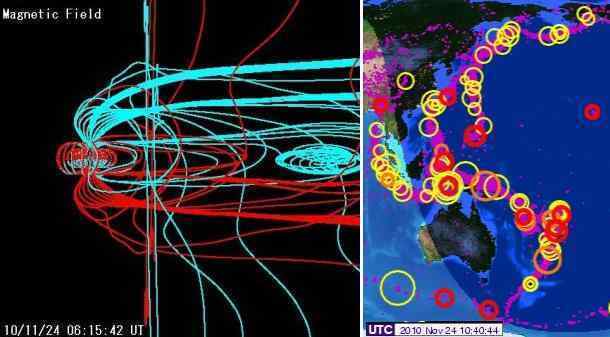 We have consistently warned that electro-magnetic pulse, the arcing from the electronic screech in compressed rock to the charged tail of Planet X, will be on the increase. This brings down the grid, as surge and brownout destroy electronic infrastructure and electronic grids are designed to protect themselves thus. Blackouts, electronically damaged airplanes such as AF447 and MH370 and now AA8501, and interference with mankind’s satellites will be on the increase. 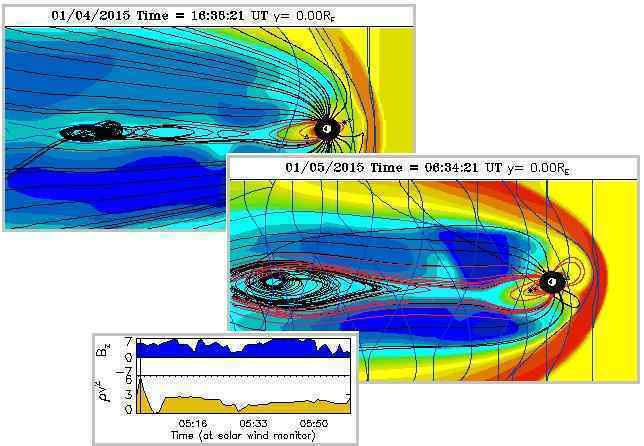 BATSRUS Y-Cut Magnetosphere cygnet continues showing an eddy flow of magnetons daily. This just a few hours ago. as this from the other day April 14, 2019 - T18:13 - T19:49 UTC. A strongly compressed Magnetic Field can be seen in the ISWA Discover Magnetic Field lines cygnet during this period. spiking almost without interruption for almost 5 hours. BATSRUS Y-Cut Magnetosphere cygnet showing an eddy flow of magnetons during a severe magnetosphere compression, along with a increase in particle densities during a period of time with almost no solar activity early this morning. Another eddy flow during strong closed magnetic field lines. As seen in the Discover Magnetic Field readings Mar. 31, around the 02:36 hr. While the solar wind speeds and velocity remain steady. Once again showing it's not the result solar activity. BATSRUS Y-Cut and other magnetic models previous to another polarity increase. The blank images to note the missing frames from T20:12 - T20:34 UTC. Strong magnetic twist and severe compression showing in the first few frames. Strong magnetic eddy flows behind the Earth almost without interruption for over 7 hours last evening.